The operators of a mobile app that promised cash incentives to get consumers to commit to fitness and nutrition goals have agreed to settle Federal Trade Commission allegations that they falsely promised that consumers who met weekly goals would be paid financial rewards, and unfairly billed many consumers without their consent. 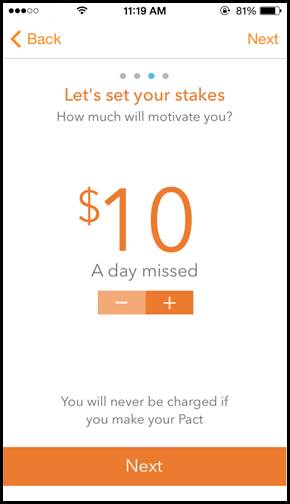 Consumers who used the Pact app made “pacts” to exercise a certain number of times per week or meet dietary goals, and agreed to be automatically charged an amount, ranging from $5 to $50 per missed activity, if they did not complete their pacts. Consumers who met their weekly goals were supposed to receive a share of the money collected from those consumers who did not. Consumers’ weekly goals and monetary incentives carried over to the next week unless consumers changed or canceled them. In its complaint, the FTC alleges that the defendants charged tens of thousands of consumers the monetary penalty even when the consumers met their goals or after they cancelled the service. For example, one military consumer complained that the defendants charged her for missed pacts when she could not get the app to recognize the gym at the Air Force base where she was stationed. Another consumer said she deleted her account but continued to be billed more than $500 in recurring charges. The FTC further alleges that the defendants failed to adequately disclose to consumers how to cancel the service and stop recurring charges. The FTC alleges that the actions of Pact, Inc., and its principals Yifan Zhang and Geoffrey Oberhofer, violate the FTC Act’s prohibition against unfair and deceptive practices and the Restore Online Shoppers’ Confidence Act (ROSCA). ROSCA prohibits using a negative option feature to charge consumers for goods or services unless the material terms of the transaction, including the method to stop recurring charges, are clearly and conspicuously disclosed before obtaining consumers’ billing information. As part of the settlement, the defendants are prohibited from misrepresenting the circumstances under which they will charge or make payments to consumers, and from charging consumers without their express, informed consent. The defendants also agreed not to market or sell products that include a negative-option billing feature without clearly and conspicuously disclosing the terms to consumers. In addition, consumers will receive more than $940,000 in earned cash rewards and refunds for improper charges as part of a $1.5 million judgment, the rest of which is suspended. Pact has already begun the process of returning money to consumers, and, under the terms of the settlement, must notify consumers and complete payments of more than $940,000 within 30 days of entry of the order. The Commission vote authorizing the staff to file the complaint and stipulated final order was 2-0. The FTC filed the complaint and stipulated final order in the U.S. District Court for the Western District of Washington. The order is subject to final approval by the Court.